Cheryl Yeoh was driven down the path of entrepreneurship based on her innate yearn to create, a trait that has been instilled in her since her school days by her mother. There are many causes for one to wade into the high-risk but equally high-reward world of entrepreneurship. Some are tempted by the monetary gains; others are propelled by the legacy they stand to create; there are also those who seek for nothing more than to impact positive change for those around them. Cheryl Yeoh was driven down the path based on her innate yearn to create, a trait that has been instilled in her since her school days by her mother, who also ran a series of businesses herself. “When I was young and growing up in Malaysia, I was always starting businesses,” says the former founding CEO of Malaysian Global Innovation & Creativity Centre (MaGIC), who is now based in San Francisco and makes regular trips home. “Even though they are small undertakings like selling stuff at the flea market, my mum would encourage me to do that. Seeing her be her own boss implanted in me that invaluable mentality of starting businesses." The Petaling Jaya native has come a long way since her flea market days. She is today one of the most sought after speakers at entrepreneurial forums, and for good reason. Fifteen minutes with her and you'll have learned invaluable advice in business and entrepreneurship since she did establish two tech companies, currently sits on the board of various startups in advisory role and invests in equally as many in which she sees potential. 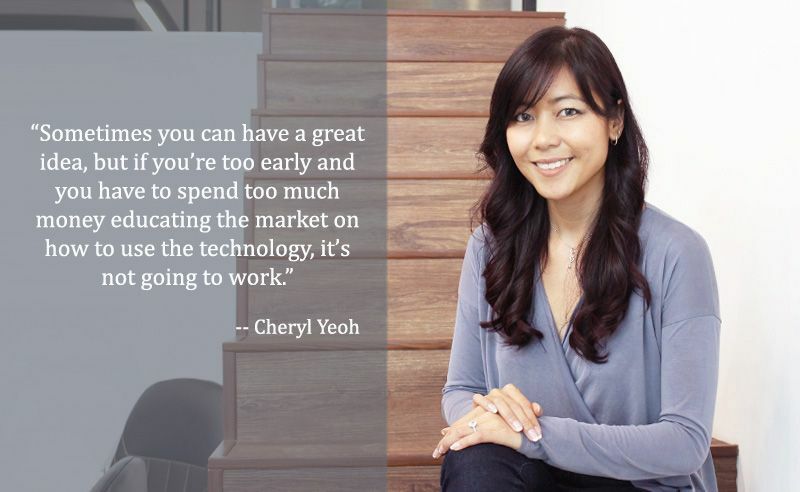 Today she is the head of her own consulting company Cheryl Yeoh & Co and her journey is one peppered by determination, perseverance and a very steep learning curve. Up until she was 18, Yeoh had never left the country. Her first time out of Malaysia came in the form of a government JPA scholarship to Cornell University New York, where she took a major risk and delved into operations research and industrial engineering despite her creative calling. It turned out to be exactly what she needed to complement her business acumen. She worked for a few consulting companies for experience and obtained her Masters’ degree along the way. The moment she got her Green Card, she got immediately to putting her first tech startup to work. “I started with CityPockets, a daily deal digital wallet. It helps people store the daily deals vouchers that they’ve bought and sends a reminder when the expiry date draws close. If they can’t use it in time, they can even sell the vouchers back to a secondary market place,” regales Yeoh. Realising a flaw in the system early on, they pivoted and rebranded it to Reclip.It, which to date is one of her biggest successes. It helps users make shopping lists out of the coupons which run heavily in the US retail landscape. If you have a certain item on your shopping list for which you have a coupon you can redeem, it will automatically tag it for you, going to the extent of printing it out along with your grocery list. It caught the eyes of US hypermarket and departmental store giant Walmart, who not only acquired the app, but also got her and her co-founder onboard as consultants to integrate the system into its e-commerce site. Just as she was beginning to seek newer pastures to try out, home came calling. Her journey with MaGIC started when she was invited by the Malaysian government to spearhead the initiative aimed to help train and put local startups on the global map. In under two years, she set the foundation for 15,000 startups of various categories, from coding and digital marketing to data analysis, to gain the exposure they need by connecting them to the right people as well as each other. “It’s important to have information flowing freely,” Yeoh tells. “That ecosystem is so important to an entrepreneurial community. If you’re cooped up in your office all the time, just building your company by yourself, you cannot learn from other people." "Sometimes you can have a great idea, great team, great aspirations but if you’re too early and you have to spend too much money educating the market on how to use the technology, it’s not going to work." Beyond creating that community, she also successfully initiated a database of all the startups and investors in the country and negotiated a 3-year partnership with Stanford University to expose entrepreneurs to the Silicon Valley culture and ecosystem over a 2-week immersion program. This was on top of a long list of career fairs, forums and symposiums headlined by some of the biggest speaker names in entrepreneurship. Through her experience with MaGIC, which she describes as “a lot tougher than starting my own company”, she is very excited for what is in store for the Asian startup landscape. How does one get there to be a good entrepreneur? “It’s hardwork and luck,” she tells matter-of-factly. Hardwork is self-explanatory but “luck because it’s market timing. Sometimes you can have a great idea, great team, great aspirations but if you’re too early and you have to spend too much money educating the market on how to use the technology, it’s not going to work. Or you can be too late when the market already really crowded." If you have an idea and you believe it’s worth pursuing, Yeoh also shares with us a few tips to make sure it’s really worth the time and money you’re inevitably going to spend on it should you decide to act on it. Checking off all of Cheryl's tips above with her startup is Francesca Chia, whose spearheads GoGet.